I am addicted to quality meals and I’m always looking for new experiences, so Belvárosi Piac was a pleasant surprise for me! The Hold street market is a historical building close to the US Embassy. 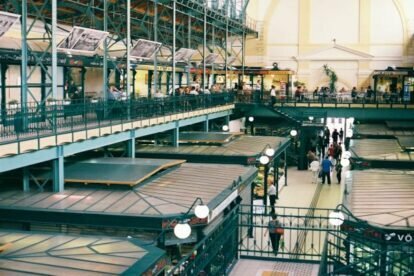 The market’s first floor is a kind of food court but in an old-school market style. The buffet is run by the best Hungarian restaurant. I’ve seen their owner or the chef serving food many times – I was speaking to one of them and he said that this was the aim of the place, they do it personally. My favourite is the traditional Thai ramen car, but there is also a Russian-born Hungarian chef creation called “Moszkva Tér”, the kosher Hungarian Séf utcája and Steamboo’s Asian flavours, which are also cool. The essence of this unity is delivering quality office food which is affordable and can provide a quick lunch in the business quarter. It is not the cheapest market buffet for lunch but I am 100% sure it’s the best one in Budapest. Tamás Széll (Bocuse d’Or finalist chef) opened his own restaurant on the market which is extremely busy but definitely a reason to visit! I truly love this place and hope you can find a seat!